Serena Williams was expecting to take "baby steps" on her return to tennis as a mum but after reaching the Wimbledon final wants to make giant strides. The former world number one will be seeking a record-equalling 24th Grand Slam title when she faces Angelique Kerber in Saturday's showpiece. Despite being only four tournaments into her return, she has been many people's favourite for an eighth title. "This is not inevitable for me," said Williams, who gave birth in September. "It's no secret I had a super tough delivery. I lost count after, like, four surgeries because I was in so many surgeries. There was a time I could barely walk to my mailbox. "It's like, come on guys, this is pretty awesome. To hear people say, 'Oh, she's a favourite' - the last 16 months, I've played four tournaments, and was carrying another human half that time. It's interesting." Williams, 36, arrived at the All England Club ranked 181 in the world and seeded 25th but these numbers have been fooling no-one. Although her 6-2 6-4 victory over German 13th seed Julia Gorges on Thursday was her first match against a top-50 player at these championships, she has shown enough power, desire and stamina here to answer any questions over the shape she is in. Against Gorges she appeared to conserve energy by not running for the balls she was unlikely to make but then occasionally charged forward to the net to finish off a point and show she could still move around the court well. 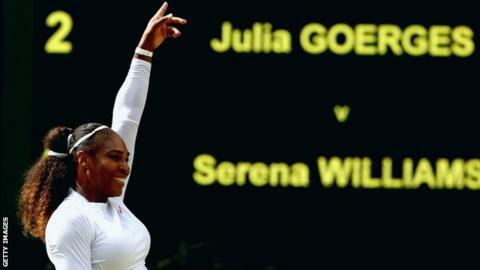 She has dropped just one set at this Wimbledon, against Camila Giorgi in the quarter-finals, and has served the second fastest serve at 122mph - just behind sister Venus' 123mph delivery. It has all meant that Williams, who will be watched on Saturday from the Royal Box on Centre Court by her good friend the Duchess of Sussex, is the favourite for a title that will make her the fourth Grand Slam-winning mum of the Open era. It will be a rematch of the 2016 final, which Williams won, and the American says she will need to be at her best to beat the German 11th seed again. "She's playing so well. I think she's incredibly confident," she said. "I have to be ready for the match of my life." It seems her progress since her return - which included reaching the fourth round at the French Open last month but withdrawing through injury - has surprised her. "I was expecting a few more baby steps myself," she said. "Again, I've said it all week, this is only my fourth tournament back. "[But] Every time I go out there, I want to I guess take a giant step forward, keep taking giant steps, but keep improving." Williams, seems to have taken the lead from her 10-month daughter in her approach to her comeback that has taken her to a 10th Wimbledon final. "She's walking, maybe a little too fast," she said. "She's trying to go faster than her body will allow her to go. She's moving those feet. She kicks her little feet really hard. I've been learning a lot from her."